For the small settlement of Hartley Bay in Ontario, see Killarney, Ontario. Hartley Bay is a First Nations community on the coast of British Columbia. 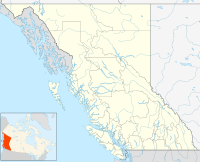 The village is located at the mouth of Douglas Channel, about 630 kilometres (390 mi) north of Vancouver and 145 kilometres (90 mi) south of Prince Rupert. It is an isolated village accessible only by air and water with a population of 200. It is home to the Gitga'ata (sometimes Gitga'at or Gitk'a'ata), which means "People of the Cane." The Gitga'at are members of the Tsimshian nation. As of 2013, 167 band members live on the reserve and 533 members live off reserve in Prince Rupert, Vancouver or other regions. The community is served by seaplane and ferry from Prince Rupert. A distinctive feature of the community is the wooden boardwalks which are used rather than gravel roads. The Gitga'at geographical name for the bay where the village is situated is Txałgiu. This name was anglicised to Kalkayu when Indian Reserves were formed in 1889, these being Kulkayu (Hartley Bay) Indian Reserve No. 4 and Kulkayu (Hartley Bay) Indian Reserve No. 4A (the community is physically on No. 4A). The ancient winter village of the Gitga'at, known today as Lax Galts'ap or "Old Town," is located 12 miles (19 km) north on Douglas Channel. There was also a village site in a small bay on Gil Island, not far from where the Queen of the North sank. Capt. George Vancouver anchored there in 1793, where he observed remains of houses. Both of these ancient sites continue to be used by the Gitga'at today, as they do other important resource and cultural sites within their traditional territories. Hartley Bay was established and settled in 1887 after a number of families left Metlakalta, B.C., where they had joined other Tsimshian people at the utopian mission begun by the lay minister William Duncan. When Duncan and his Tsimshian supporters moved to New Metlakatla, Alaska, many of the Gitga'at returned to their traditional territories. However, they chose to settle at Txałgiu rather than their ancient village. For most of the twentieth century, the fishing industry sustained the people of Hartley Bay. Today, however, with the decline of the fishing industry, employment has diversified, with tourism playing a significant role. For example, several Hartley Bay residents work at nearby fishing lodges during the summer as guides. Air service is through Hartley Bay Water Aerodrome. Under the Köppen climate classification, Hartley Bay features an Oceanic climate with chilly winters and mild summers. The area receives copious amount of precipitation throughout the course of the year averaging roughly 4500 mm of precipitation annually. While the area experiences rain throughout the year, the summer months of June, July and August are noticeably drier than other times of the year. The area does experience snowfall averaging roughly 200 mm per year. However Hartley Bay typically experiences precipitation in the form of rain during the winter months. Campbell, Kenneth (2005). Persistence and Change, A History of the Ts'msyen Nation. First Nations Education Services, SD 52, Prince Rupert. Seguin, Margaret (1984). The Tsimshian: Images of the Past; Views for the Present. UBC Press. ISBN. 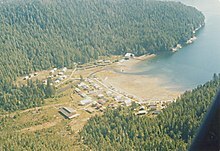 "Hartley Bay (community)". BC Geographical Names. "Kulkayu (Hartley Bay) Indian Reserve 4". BC Geographical Names. "Kulkayu (Hartley Bay) Indian Reserve 4A". BC Geographical Names. ^ "Hartley Bay". Indigenous and Northern Affairs Canada. 2013-02-06. ^ "Calculation Information for 1981 to 2010 Canadian Normals Data". Environment Canada. Archived from the original on February 17, 2014. Retrieved July 9, 2013.